Sailing 11th December 2016, this 10-day Mexican Riviera cruise on board Oceania Cruises’ Sirena, sails roundtrip Los Angeles and visits Catalina Island, Ensenada, Cabo San Lucas, La Paz, Mazatlan and Puerto Vallarta. A deluxe ocean view stateroom is priced from £2,224pp (was £4,329pp) with a saving of £2,105pp and includes return flights from London, all on board meals, free internet and a choice of either $600 free shipboard credit (per stateroom), a free beverage package (per person) or six free shore excursions (per stateroom). Sailing 27th March 2017, this 18-day Asia cruise on board Oceania Cruises’ Nautica, sails from Bangkok to Mumbai and visitsKo Samui, Singapore, Phuket, Rangoon (two nights in port), Colombo and Goa (Mormugao). A deluxe ocean view stateroom is priced from £3,255pp (was £7,529pp) with a saving of £4,274pp and includes return flights from London, all on board meals, free internet and a choice of either $800 free shipboard credit (per stateroom), a free beverage package (per person) or eight free shore excursions (per stateroom). Sailing 14th April 2017, this 20-day Middle East and Mediterranean cruise on board Oceania Cruises’ Nautica, sails from Mumbai to Athens visiting Salalah, Aqaba and Luxor (Safaga, overnight in port). The cruise then transits the Suez Canal and continues to Jerusalem (Haifa, overnight in port), Limassol, Patmos, Rhodes and Santorini. A deluxe ocean view stateroom is priced from £3,059pp (was £5,819pp) with a saving of £2,760pp and includes return flights from London, all on board meals, free internet and a choice of either $800 free shipboard credit (per stateroom), a free beverage package (per person) or eight free shore excursions (per stateroom). Sailing 2nd June 2017, this 10-day northern Europe cruise on board Oceania Cruises’ Marina, sails from Southampton to Copenhagen and visits Paris (Honfleur), Bruges (Zeebrugge), Antwerp, Amsterdam, Hamburg (Bremerhaven), Kristiansand, Oslo and Gothenburg. A veranda stateroom is priced from £2,328pp (was £4,959pp) with a saving of £2,631pp and includes return flights from London, all on board meals, free internet and a choice of either $600 free shipboard credit (per stateroom), a free beverage package (per person) or six free shore excursions (per stateroom). Sailing 6th July 2017, this 20-day transatlantic voyage on board Oceania Cruises’ Nautica, sails from Miami to Reykjavik and visits Port Canaveral, Norfolk, New York, Boston, Bar Harbor, Saint John (Bay of Fundy), Halifax, St. John’s, Nuuk, Paamiut (Frederikshab), Qaqortoq, and Grundarfjordur. An ocean view stateroom is priced from £4,222pp (was £7,579pp) with a saving of £3,357pp and includes return flights from London, all on board meals, free internet and a choice of either $800 free shipboard credit (per stateroom), a free beverage package (per person) or eight free shore excursions (per stateroom). Call 0345 505 1920 or visit www.OceaniaCruises.com to book. Featuring a fleet of intimately luxurious ships, Oceania Cruises offers an unrivalled vacation experience renowned for the finest cuisine at sea and destination-rich itineraries spanning the globe. 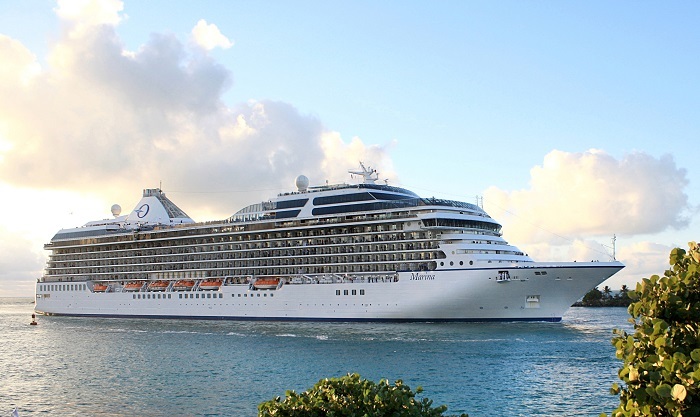 Seasoned world travellers are drawn to Oceania Cruises’ expertly crafted voyages, which call on more than 370 ports across Europe, Asia, Africa, Australia, New Zealand, the South Pacific and the Americas. Spacious and elegant accommodations aboard the 684-guest Regatta, Insignia, Nautica, and Sirena and the 1,250-guest Marina and Riviera invite guests to explore the world in unparalleled comfort and style. All offers subject to availability and change at any time. Full terms and conditions apply.